Socializing your puppy as soon as possible after they have had their inoculations is vital if they are going to learn how to behave around other animals and people outside of their immediate family. However, to do this you need to be able to control their movements and restrain them when necessary. This is an essential part of keeping your puppy safe around other animal and potential hazards — and a puppy harness can help. A puppy harness is often considered the best means to achieve this, but there are numerous brands and types on the market. Our panel of pet lovers and dog experts have created this list of the best puppy harnesses to help you make the right choice for you and your puppy. The Voyager All Weather Step-in Mesh Harness is a simple and easy to use harness that is suitable for use all year, regardless of the weather. Created from a plush mesh it is comfortable for your dog to wear, while also being hardwearing and durable enough for everyday use. The simple step in design makes it easy to put on even the most excitable puppies and the Velcro fastenings mean that it is fully adjustable. The harness boasts a clip fastening for additional security and a double D-ring leash attachment. 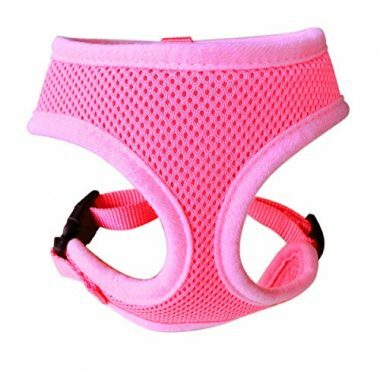 The Soft Mesh Dog Harness by BINGPET fits over your puppy’s head and features an adjustable chest belt. It is made from 100% polyester and is padded for comfort. The air-mesh design allows air to circulate so your puppy does not over heat during walks on warm days, while the quick release buckle makes the harness easy to remove. As the neck piece is not adjustable it is important to measure your dog’s neck before choosing which size to purchase. If your puppy pulls at the leash, then the Web Master Secure Harness by Ruffwear is the perfect harness for you. It benefits from having two leash attachment points to make training that little bit easier. The harness is designed with safety and comfort in mind. It has padded straps to stop rubbing and a padded handle, so you can give your dog a helping hand when needed, such as when climbing into a vehicle or clambering over rocks while hiking. For extra safety the harness includes reflective trim to help them be seen even in low light conditions. The hardness also has a built-in light loop, so you can attach a light to allow for even safer evening and early morning walks. There are five points of adjustment, so you can fit the harness to your specific dog’s shape and the harness can be hand washed and air dried to keep it looking fresh. 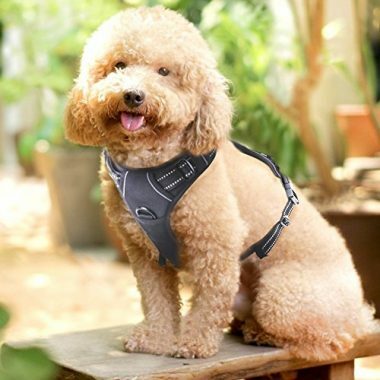 The RABBITGOO Dog Harness is made from breathable material and incudes heavy padding to make it comfortable for your dog to wear while walking. The design means that pulling pressure is evenly distributed, preventing pulling and choking. 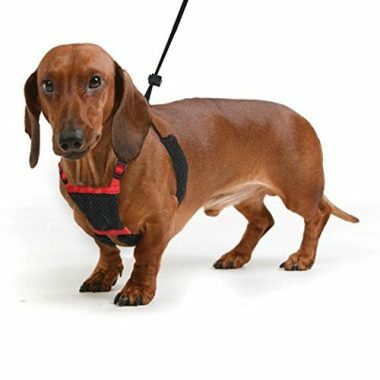 The harness has two leash attachment points and can be adjusted at both the neck and chest. Reflective strips make walking in low light safer for you and your puppy. Reflective strips for safe walking in low light. The Dog Harness by Sporn is specifically designed to address pulling in pets in a humane way with no choke. The harness fits over your dog’s head and is adjustable to ensure the perfect fit. 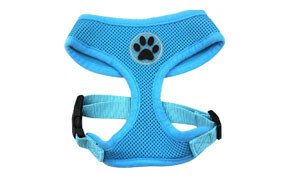 The material is comfortable, weatherproof, and durable, so the harness can be worn in any walking or playing situation. The elastic webbing stretches with your dog’s natural lateral movement, so while pulling is discouraged, their natural movement is not affected. 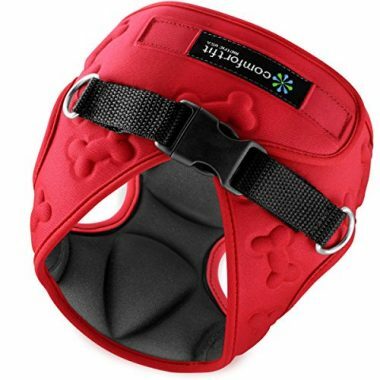 The no pull design means that when you dog begins to pull the padded sleeves tighten and gentle pressure is applied under your dog’s front legs. Elastic webbing stretches to accommodate your dog’s natural movement. 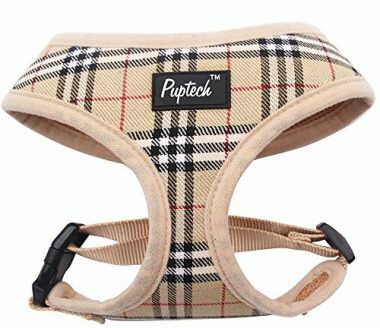 The PUPTECK Soft Mesh Dog Harness is a no pull harness specifically designed for puppies. The comfortable padded harness is made from breathable and durable air-mesh material. It is suitable for all outdoor activities and includes a back buckle and strap to provide additional security. The harness fits over your dog’s head and the back strap is adjustable to meet the specific needs of your dog. If you are looking for the perfect harness for a small to medium sized puppy, or even for a cat, then the Soft Mesh Dog Cat Harness by PACCOMFET is perfect for you. Made from padded 100% polyester that is covered with a breathable mesh, the harness is comfortable and durable. The harness fits over your dog’s head and has an adjustable back strap which is secured with a click buckle fixture. The Original EcoBark Maximum Comfort & Control Dog Harness by EcoBark Pet Supplies is designed to suit the needs of all dogs regardless of age or size. 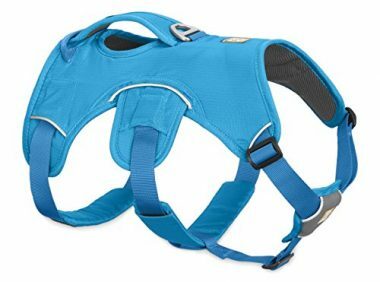 The over the head design comes with an adjustable back strap to ensure the harness fits comfortably and securely. The harness is highly durable, and the straps are eco-friendly as they are made from recycled water bottles. The no-chock design protects your dog’s throat while the padded mesh provides added comfort during a wide range of outdoor activities. Comfort Fit Metric USA have designed their Easy to Put on and Take Off Small Dog Harness to meet the needs of even the smallest dog breeds. The step-in design is made from soft cushioned fabric to provide your dog with the security and comfort they need for all their outdoor activities. The harness is lightweight and is secured in place with Velcro and a click buckle for additional security and quick release when necessary. In this section of the buying guide, we will look in more detail at some of the reason why you should choose a harness over a more traditional collar and leash. We also explore questions around when you should start leash training your puppy, what makes a good harness, and just as importantly how you should put on a harness so that it fits correctly. Collar Vs. Harness: Which Is Best for Your Puppy? Before looking into the pros and cons of collars and harnesses it is important to note that you should discuss any specific health or behavioral issues with your veterinarian before making your final decision. If your dog has neck or back issues, is a particular flight risk, or a nervous dog, their recommendations supersede our advice. Where this is not the case, then your choice of collar or harness depends firstly on the individual needs and preferences of your puppy. However, it can help to understand a little more about the pros and cons of harnesses and collars. A puppy harness is an effective training tool for puppies. Puppy Harnesses are ideal for specific breeds such as pugs. These and some other breeds risk their eyes protruding from the sockets if they experience too much pressure around the neck. Puppy harnesses discourage jumping and pulling, providing better control over your puppy. Additionally, puppy harnesses help to focus distracted puppies. Similarly, puppy harnesses are beneficial for short nose dogs who can experience a high risk of respiratory problems. A puppy harness reduces stress on the windpipe and cuts the risk of severe coughing episodes. A puppy harness can provide comfort for a nervous dog. Not all dogs like the feel of a harness – although if you start early with a harness designed for puppies, such as the PUPTECK Soft Mesh Dog Harness this should not be an issue. A dog might not like the feeling of a harness. Some experts consider the back-clip harness to not be 100% effective. However, there are several on the market that has more than one leash attachment point, giving you the freedom to choose the point that is best for your puppy. Such harnesses include the Ruffwear Web Master Secure and the RABBITGOO Dog Harness. Collars are an alternative for puppies that dislike the feeling of a harness. Collars are functional and can hold your dog’s information such as license tags, rabies details, and identification. However, this information can be added to your puppy’s harness as well. A collar is not ideal for training and can easily become uncomfortable. Any slight pulling on the collar while walking or training can increase the risk of a neck injury. Collars can create eye pressure, which in turn can worsen issues such as glaucoma. Collars can cause or worsen a range of other issues such as ear and eye problems through pressure on the neck, thyroid issues if the collar damages the gland, and behavioral problems associated with injury and pain. It is much easier for your puppy to slip their collar than it is for them to slip out of a properly fitted harness. What Age Should I Start Walking My Puppy on a Leash? While puppies should not be on the ground outside the home until they have had their core puppy vaccinations, training with a leash can begin much earlier. You can put a lightweight harness on your puppy from as early as a few weeks old. Wearing the harness around the home helps them to get used to the feel of it as they move. If you treat your pup and offer plenty of praise when putting the harness on, it fosters positive associations for when they are ready to go out into the world. Once they are used to the harness itself, attach their leash and begin to guide them around your indoor space with the harness and leash. Again, make this a positive experience with lots of praise. Put the harness and leash on your puppy when you take them to the garden for toilet training as well. This helps you designate a toilet training spot, as well as helping your young dog get used to walking on a leash. Taking these steps means that by 16 weeks when they have had all their jabs walking on a leash and wearing their harness is second nature. What Makes a Good Puppy Harness? Easy to put on – you don’t want a harness that is complex to put on and gets your dog either over excited or worked up about going out. 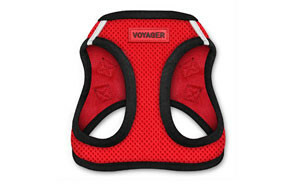 The Voyager All Weather Step-in Mesh Harness by Best Pet Supplies Inc, is the perfect example of an easy to fit harness. Adjustable – It is important that the harness fits correctly. It should adjust at least across the chest or around the body. 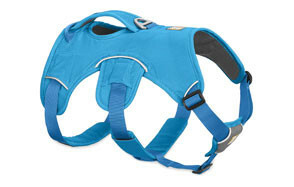 Others also adjust around the neck such as the Ruffwear Web Master Secure. Secure – It is essential that your puppies harness is secure so that they cannot slip out of it. Quick release clip locks, in addition to Velcro straps, are the perfect answer. The leash attachment should also be reinforced and sturdy. Metal D-ring attachment points are popular, but heavy-duty plastic attachment points such as those on the RABBITGOO harness work just as well. 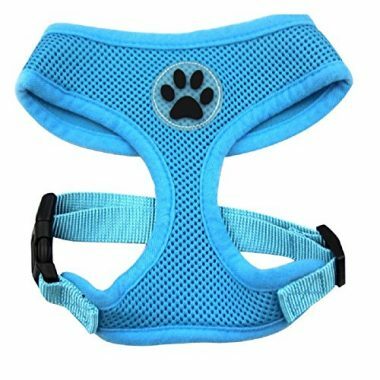 Comfortable – your puppy isn’t going to enjoy walks if they are uncomfortable, so it is crucial that you choose a harness that fits well and is made from quality material which is durable, breathable and ideally padded across the chest or anywhere else where it is in constant contact with your dog. How you put a harness on your dog will depend on the style of puppy harness you purchase. There are two main styles of harness; those that fit over the head and step in harnesses. Regardless of the type of harness, you purchase the key to correctly fitting the harness is to start with a calm dog and to practice before you start using it outdoors. 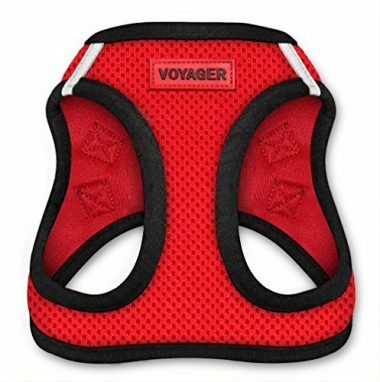 If you have an over the head harness like the PUPTECK puppy harness or a step-in harness such as the Voyager All-Weather puppy harness it is best to start with your dog in a sitting position. Have the puppy harness open and ready before you get your dog to sit. Place over the head or, for step-in versions, get your dog to raise one paw at a time and place in the leg holes of the harness. Once in place get your puppy to stand so that you can reach the straps and clips to secure it in place. When securing the harness in place you need to ensure that the straps are adjusted to provide a secure fit. Your dog should not be able to slip their legs or head out of any part of the puppy harness. However, you still need to ensure that the puppy harness is comfortable and is not so tight that it will constrict breathing or movement, and that the straps do not rub. You should be able to comfortably pass your fingers between the straps and your dog’s body. Following these simple steps and our detailed buying guide ensures that you purchase a harness that your dog will love, and which only increases the joy of walks for both of you.